There are few races in a year when everything comes together and works as planned. 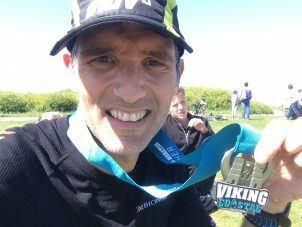 The Viking Coastal Marathon was to be one of those. I had had two months of solid marathon running starting with the Paris Marathon at the beginning of April when I achieved a PB of 3 hours 16 minutes, but missed my goal time of sub 3:15 by a minute. Two weeks later I ran my first London Marathon and finished in 3 hours 18 minutes whilst carrying the camera and filming. There was a very wet and windy Three Forts Marathon which is 27 miles long and which I completed in a good time of 4 hours 28 and finally the Richmond Park Marathon which I really enjoyed and strolled round in just over 3 and a half hours without really pushing myself too hard. So came the Viking Coastal Marathon in Kent. A loop of just over 10k out and back along a flat coastal path, starting at 7am. I think the start time is significant in that because it was so early, the wind didn’t have a chance to build up too much before we finished. It’s quite an exposed path and I imagine any wind would seriously affect a runner’s ability to keep to pace in one direction or the other. We had to get up at stupid o’clock to drive to Kent but it was a fine crisp morning when we got there. Registration was only just getting set up with half an hour to go to the race start. I was feeling that early morning lethargy but I also knew I was fit and ready for the run. There were only 150 or so competitors and the whole thing had that lovely small race feel. I had my camera with me but had no plans to take it on the run with me. Instead, I entrusted random filming to my wife and middle son, with unfortunate but hilarious consequences. We set off bang on 7am and I immediately settled in to my planned race pace of 4:35 per kilometre. A good few runners had hurtled off ahead but I had no intention of following them. I had a goal of under 3:15, l had my pace and I was sticking to it. Plus I had a feeling I may catch a few of them in the latter stages. There is very little to say about the Viking Coastal Marathon route. It is a concrete path along a sea defence wall. To one side is the sea and on the other is mostly grass and I think some allotments. It’s just over 5k to the turn point which is almost at the foot of Reculver Towers and Roman Fort, an impressive looking ruin on a hill overlooking the sea. I was disappointed that there was no aid station here. A number of people were leaving bottles which I also should have done. Having said that I didn’t really want to stop running. The other marginally annoying thing about fuelling was that the aid station at the start area was in fact 10-20 metres beyond the turn point. So each 10 and a bit kilometres I would have to run this extra few metres to pick up my food and water. Not the greatest hardship but something which could possibly be improved for next time. I felt solid and strong for almost the entire run. I stuck to my nutrition plan of a baby food pouch at 9 miles and another at 19 miles. I was drinking water at each 10k turn and after two laps I took a bottle with me and dropped it off half way up to pick up on my return. Many of the runners who went off like crazy at the beginning did eventually begin to slow. I worked my way up to 5th place by around 25k in and had my sights set on the 4th place guy. Coming up to the final loop I was right behind him. However when I came up to overtake, I could see the chap in third place had almost started going backwards. He was run walking and had obviously hit the wall. So in the space of a few minutes I had gone from 5th to 3rd in the Viking Coastal Marathon. The two runners ahead of me were quite a way ahead. The leader had been in front from from the start. The guy in second had done the same as me having worked his way up the field from further back over the course of the race. During the final lap I felt I was gaining on him a little but not much. I began to tire in the final 2 or 3 kilometres but there was no way I was going to be caught. I was still running pretty strong. I crossed the line in 3:13 in third place and I was absolutely delighted with that. London good for age qualification and a podium place…..although no prize for third. Rubbish. I did get a little worried when the winner of the race told me that London has recently changed the gfa qualifying criteria and that my time wouldn’t get me in. However I was pretty sure he was wrong and a quick check on the website proved everything was in order. The only other minor niggle I had was this. The Viking Coastal Marathon is actually two races run on Saturday and Sunday. I did the Sunday marathon, but when I looked at the results of the Saturday marathon, turns out my third place time would have been the winning time if i had run the day before! 24 hours earlier and I would have had my first ever race win. Despite the lap nature of the race, it was a really nice day. Family and friends can sit on the grass and they get to see you 4 times at the end of each lap. It has a friendly community feel and just as many fun runners as so called serious racers. My wife told me that many of the runners stopped at the end of each lap to chat, rest, drink and eat, not worried in the slightest about time. On the other hand, if you are looking for a fast marathon time, this is almost certainly the flattest marathon course in the UK. 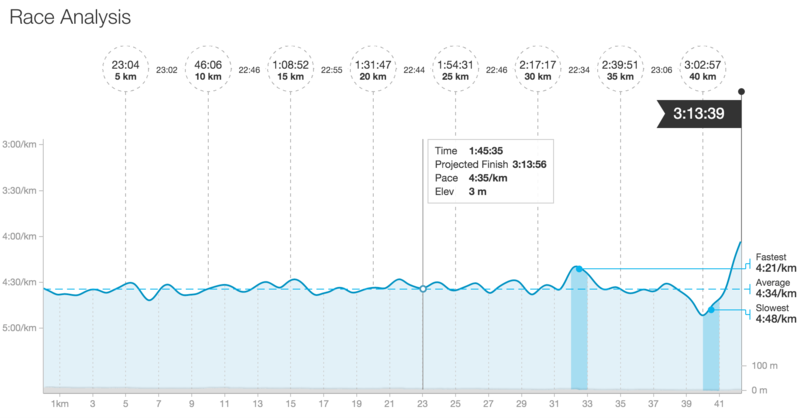 I suit lapped courses I think, and the two big marathon PBs I have achieved have both been on lap courses. In addition, both have been picturesque and very pleasant. I did not get bored of the view during my 3 hours 13 minutes on the course. 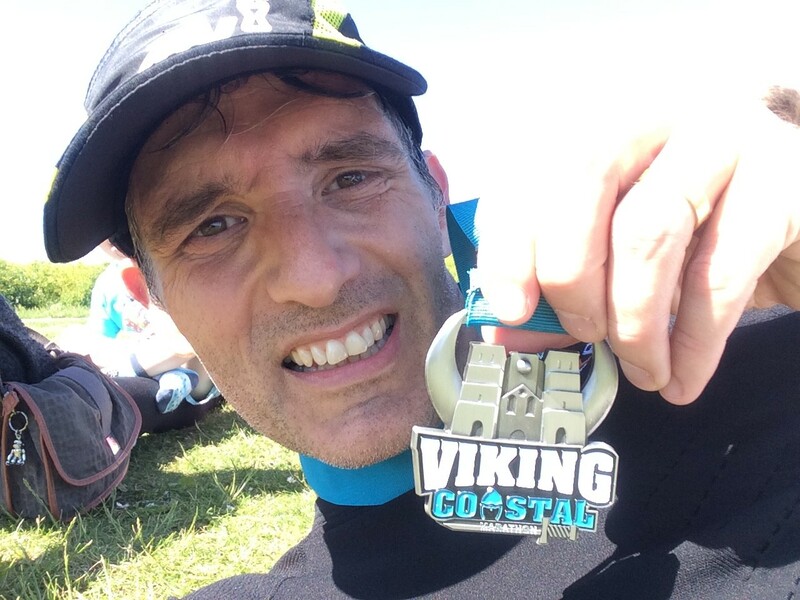 If you have enjoyed this Viking Coastal Marathon race report please ‘like’ and share it with your friends and anyone you think may be interested in running the race in the future.